Let me read you the description: Max’s Witte Ruby Red Trout, To celebrate the Witte Museum’s current Amazon exhibit, we’ve created a special entre’e! 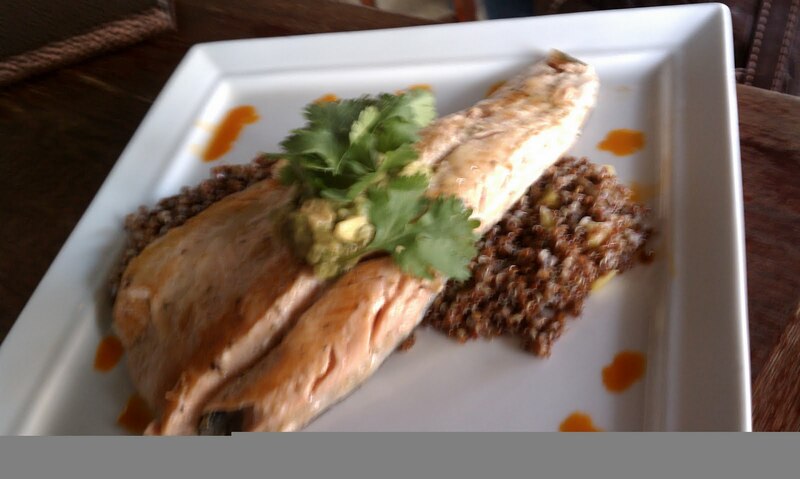 Chef James is searing fresh Ruby Red Trout and serving it over red quinoa, mango, pecan, mint salad with an avocado Serrano relish. Max’s will donate $1 from the sale of every trout dish to our community partner, the Witte Museum, to help support the Amazon exhibit and the museum’s other great programs. I ordered it, and here it is. I loved the whole pecans beneath the fish. I can hardly tell you how I am feeling just now. Andre’a, my server, has walked past me several times smiling as I continue to pick just one more morsel from the skin of this trout. She took it away, the plate that is. She is delightful. She has great glasses. If you come to San Antonio, you should come to Max’s. It’s near The Quarry. Ask for Andre’a. She is a really god server. My experience here has been amazing. I came here to work on web pages. I guess that is where I’ll head next. Thanks to Chef James, Hostess Jordan, and Server Andrea (pronounced Andre’a) I think I’ll be back. I've already looked at the menu. I'm coming back tomorrow for the Spanish White Gazpacho and the Hummus) 2 separate things. San Antonio is one of my fave cities — have you done the riverwalk? I would even kiss you! Wait until tomorrow. The chef is saving the special gazpacho for me because he's pulling it from the menu!